WINNER OF BAYSIDE CITY COUNCIL AUSTRALIA DAY ENVIRONMENT AWARD 2016! 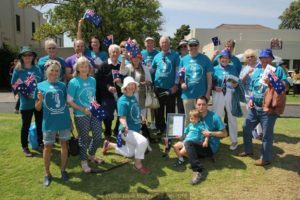 The Australia Day Environment Awards recognise the environmental excellence of individual Bayside residents or an organisation by taking leadership in the local community with an initiative, project and/or activity. The Award particularly recognises those residents that aim to empower and inspire others, form partnerships and show commitment and perseverance. Beach Patrol 3193 Ricketts Point – won the organisation award in honour of its work protecting the Ricketts Point Marine Sanctuary. Come and join us! 3193 BeachPatrol is based at the unique Ricketts Point Marine Sanctuary, Beaumaris, which was established by the Victorian Government in November 2002. We meet on the first Saturday of the month at 11 am near the Ricketts Point Teahouse, Beach Road, Beaumaris (and occasionally Black Rock – so make sure you read our email alerts!). In addition, members often do their own individual clean-ups. We operate under the auspices of both Marine Care Ricketts Point (www.marinecare.org.au), a not-for-profit group which works with Parks Victoria to protect the Sanctuary, and Beach Patrol Australia. People who join 3193 Beach Patrol Ricketts Point are also encourage to join Marine Care Ricketts Point. During its 12 years, the variety of marine, bird and indigenous plant life has increased dramatically in the Sanctuary. It is a breeding ground for numerous fish and marine life not seen in the Bay for years. All marine animals and plant life are protected and may not be caught or removed from the Sanctuary. Ricketts Point also features in paintings by a number of famous Australian artists, including Tom Roberts and Fredrick McCubbin. It is still used as a haunt by artists today. 3193 Beach Patrol Ricketts Point is a friendly, open group which welcomes people from all over Melbourne, of all backgrounds and ages, including those with children, to get involved. We are passionate about protecting the Sanctuary environment. Removal of litter on the beach and foreshore is a key protection activity. This litter, including plastic, can slowly kill marine creatures as it is consumed mistakenly as food, or wraps around their fins, throats and legs.